The siege of Mohamed Merah suspected of seven killings in Toulouse, southern France, is nearing its end, police sources say. Three loud explosions were heard from the apartment block in the city of Toulouse at about 10:30 a.m., with reports police are now inside the flat. The siege of the building where Mohamed Merah, 23, is holed up has lasted more than a day. Interior Minister Claude Gueant had said Mohamed Merah wanted to die “gun in hand” and there was no contact overnight. It was not certain he was alive, Claude Gueant said. However, the minister said it was “quite strange that he did not react” to the explosions that were set off overnight to intimidate Mohamed Merah. “We heard two shots, we don’t know what they were,” Claude Gueant said. A number of explosions, beginning late on Wednesday, had prompted deputy mayor Jean-Pierre Havrin to tell local media that “negotiations have finished and the assault has begun”. However, sources from the French interior ministry later said this was only the start of an operation to put pressure on Mohamed Merah. “[The blasts] were moves to intimidate the gunman, who seems to have changed his mind and does not want to surrender,” interior ministry spokesman Pierre-Henry Brandet told Reuters. Mohamed Merah had given conflicting messages about surrendering. Officials said Mohamed Merah was armed with a Kalashnikov high-velocity rifle, a mini-Uzi 9 mm machine pistol, several handguns and possibly grenades. Street lights were switched off in the vicinity of the building on Wednesday evening. The five-storey block of flats has been evacuated, and police also moved residents from nearby buildings. Police had surrounded Mohamed Merah’s building after two officers were shot at when they tried to get into his flat early on Wednesday morning. Elsewhere in the city, police are hunting for accomplices and have detained several members of Mohamed Merah’s family. 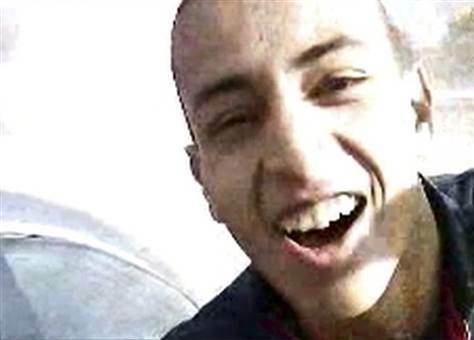 Francois Molins said on Wednesday that Mohamed Merah had planned to kill again. “If he’s telling the truth, he would have left his house this morning and he would have once again killed any soldier that he came across,” he said. Francois Molins said the suspect had expressed no regret for the killings, but had said he wanted to kill more people and “bring France to its knees”. Mohamed Merah has said he acted to “avenge Palestinian children”. He claimed to have received al-Qaeda training in Pakistan’s Waziristan area, and also said he had been to Afghanistan. Claude Gueant defended intelligence services for not preventing the attacks, describing Mohamed Merah as a “lone wolf”. “The domestic intelligence agency tracks a lot of people who are involved in Islamist radicalism. Expressing ideas… is not enough to bring someone before justice,” Claude Gueant said. Christian Etelin, a lawyer who has previously acted for Mohamed Merah, said his client had violent tendencies. “There was his religious engagement, an increasing hatred against the values of a democratic society and a desire to impose what he believes is truth,” Christian Etelin said. He also denied earlier reports that Mohamed Merah had been jailed for explosives offensives in Afghanistan, saying his client was in jail in France for robbery with violence at the time – from December 2007 to September 2009.